Contribute to the creation of the second part of the play "L'histoire terrible mais inachevée de Sihanouk Roi du Cambodge" (“The terrible though unfinished story of Sihanouk, King of Cambodia”) by Helene Cixous. The seven hour long play in Khmer language allows a difficult page of Cambodian history to be revisited on stage. A very emotional show with 30 young talented Cambodian artists.
" L'histoire terrible mais inachevée de Sihanouk Roi du Cambodge" (The terrible though unfinished story of Sihanouk, King of Cambodia”) is a play by Helene Cixous written in 1985 that recounts contemporary Cambodian history starting from the country’s independence in 1953 until the collapse of the Khmer Rouge regime in 1979. 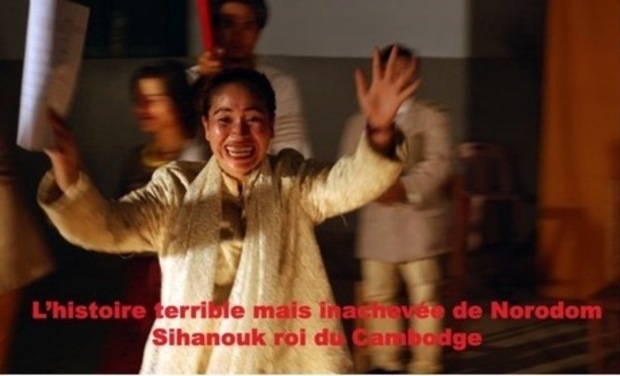 Directed by Ariane Mnouchkine at Vincenne Cartoucherie in 1985, this play has been adapted between 2007 and 2011 by Georges Bigot and Delphine Cotty with 30 Cambodian actors from Phare Ponleu Selpak. 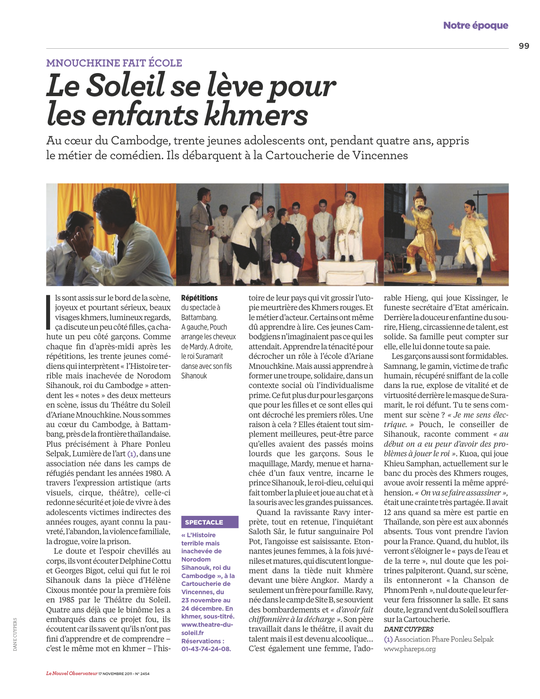 The second part of the play is a joint effort between Phare Ponleu Selpak and le Théâtre du Soleil. It goes along a thorough translation and rewording work ensuring that the play is performed in Khmer language by Cambodian actors. These latter retrace their own history helping collective remembrance. 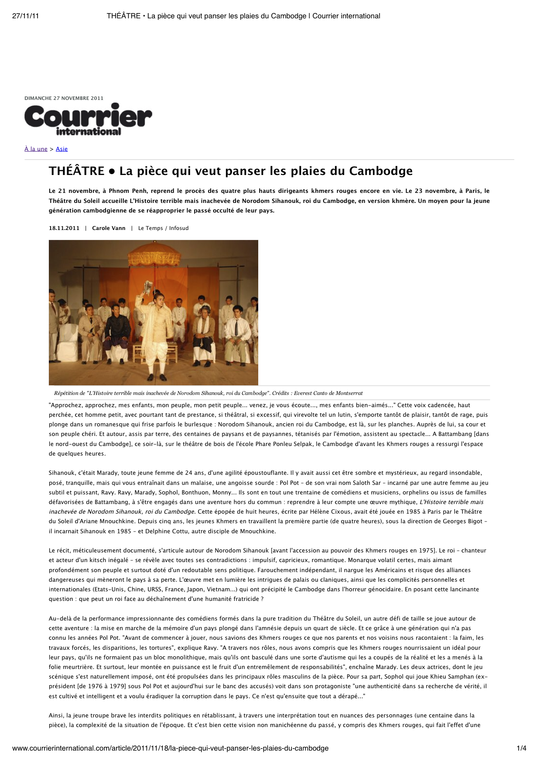 After four years of training in Battambang in Cambodia, the first part of the play was performed in France in winter 2011 at the Cartoucherie and Théâtre des Celestins as part of the festival Sens Interdit. 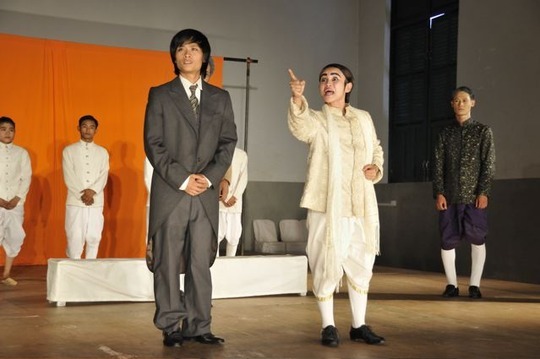 The play encountered a great success and was welcomed both by the press and the audience. From now on we are preparing the second period of the play which is to be performed in France in winter 2013. The full play will eventually be presented to the public. Georges Bigot and Delphine Cottu will start the workshops for the second period in January/February 2013 in Cambodia. The Cambodian actors are looking forward to greeting them! Phare Ponleu Selpak organization, as co-productor of this second period, counts on your support for this ambitious and meaningful project. As PPS is a public-interest organization, you will benefit from a 66% tax refund over your donations. Phare Ponleu Selpak France will send a fiscal receipt on request. Two creation and rehearsal workshops are scheduled in January/February and July/August 2013. 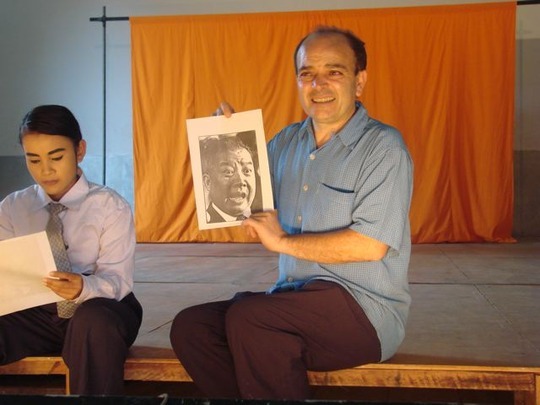 Georges Bigot and Delphine Cottu from le Théâtre du Soleil will oversee the actors for the creation works on PPS premises in Battambang. 75 days of work in Cambodia are scheduled with the 30 actors, musicians and technicians from Phare Ponleu Selpak. PPS benefited from the 10000 € prize from the EDF foundation for this project. PPS contributes to funding up to 15000 euros drawn from its capital equity. The money raised will help supporting the young artists during the rehearsals. Your name on the list of acknowledged donators displayed on PPS website. A seat booked at the Cartoucherie for the 2013 performance in addition of previous compensations. Two seats booked, a silver PPS necklace and previous compensations. Four seats booked, a painting by a young artist from PPS visual arts chosen from the catalog and all the previous compensations. Ten seats booked and a painting from a young PPS artist and your name and/or the one of your organization appears in Phare Ponleu Selpak newsletter.